I posted a bit about Lolla-PAUL-ooza on facebook, but should probably put it here on my poor neglected blog as well.... I loved the show and had a fabulous time. 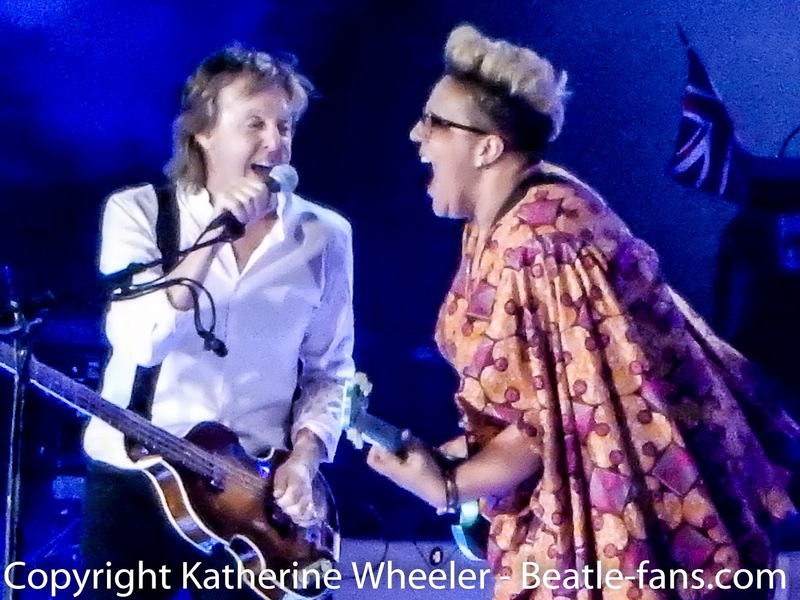 Paul keeps putting on wonderful shows and he is now reaching out to a wider and younger audience. I'll admit that I was a little pissed at him for doing Lollapalooza because I really hate crowds and the idea of general admission for such a large audience was a bit scary. I am old enough to remember the Who concert where all the people were trampled. My friend and I were pretty far back but out of the madness, safe up in our perch. We made signs on pillowcases and hung over the rail. Macca put on a tremendous show under a full moon and set the city on fire during Live and Let Die - the song that always makes the show worth seeing. I've seen McCartney a half dozen times. Although this show was only 2 hours instead of the usual 3, it had some great moments, including bringing Brittany of Alabama Shakes back out to join in Get Back, and playing Something on the ukulele. He performed some of his newer songs (I love Save Us) and he skipped Yesterday and Long & Winding Road (not my favorites anyway with his aging vocal chords). The young crowd at Lollapalooza was enthusiastically singing Four-Five Seconds, a Rihanna/Kanye West song which Macca seamlessly merged with We Can Work It Out. Only Sir Paul could take a song by modern hip-hoppers and follow it with a 50 year old tune played with an accordian and keep 'em singing! I was hoping he'd bring his mandolin and sing Dance Tonight so his drummer Abe could amuse us with his fine dance moves, but that didn't happen. They also skipped the confetti blast at the end, but in compensation, there were extra fireworks at the end of the show. As we were all slowly leaving the park and in total gridlock, the kids started singing the na-nas from Hey Jude. That gives me great hope for this generation ....and I'm happy to report that I survived Lolla-PAUL-ooza and can't wait for him to come back to Chicago again. I was interviewed about the upcoming Paul McCartney show at Wrigley Field. How cool is that! I can't wait for Sunday to see Paul. HELP! JAPAN FUNDRAISER, A“BEATLES-THEMED” EVENT TO AID JAPAN’S EARTHQUAKE & TSUNAMI VICTIMS! In response to the great humanitarian need by those affected from the recent catastrophic natural disasters in Japan, WONDERWALL Music Shoppe & Emporium in Oak Park, IL will present “HELP! JAPAN Fundraiser” to take place Thursday, April 14, 2011: Trattoria 225, 225 W. Harrison in Oak Park, IL from 6:00 – 9:00 pm. Ticket Admission: $40 per person. Honolulu native, GiGi Wong-Monaco, WONDERWALL Emporium‟s co-owner and organizer of the event describes how the earthquake motivated her into action. “Hawaii and Japan have ALWAYS had close ties, culturally and professionally. I grew up with Japanese influence all around me. I am part Japanese, on my father‟s side so this Japan disaster has hit me very hard. It‟s affected all of us here in the U.S. and globally” she added. - BRIT BEAT, America‟s Premier Tribute To The Beatles, the event‟s headliner will be recreating the historic 1966 Japan concert, The Beatles At Budokan. Performed in Chicago‟s 2010 Thanksgiving Day Parade. - The Harrison Street Ukulele Players, debuted on CBS2 Chicago Early Morning News for the upcoming 2009 inauguration of President Obama. - Jay Goeppner, who has „the world‟s best‟ John Lennon vocals, performed with Roger Daultry, Alan White and numerous music icons. - Phil Angotti, Chicago veteran musician, long time fixture in power pop community. Formerly of The Beatle Brothers, Not The Beatles, The Scuffles and other bands. - Eric Howell, Musician. Songwriter. Filmmaker. Visionary. - Sandalwood Sitar Music Ensemble, a favorite Chicago Sitar group that performs India classical ragas and adaptations of Beatles songs on traditional Indian instruments. Donated Beatles artwork, photography, books and other goods are from Beatles artists and enthusiasts including items from world renowned ukulele virtuoso Jake Shimabukuro; Wonderwall Emporium; Mark Hudson (The Hudson Brothers and Ringo‟s former producer); SHANNON, The World‟s Greatest Beatles Artist; Paul McCartney and celebrity photographer and musician, Jorie Gracen; The Beatles in India author and photographer, Paul Saltzman; local authors of Fab Four FAQ Stuart Shea & Robert Rodriguez, Chicago award winning illustrator Charley Krebs and Oak Park artist Brenda Watkins, Kathy Joyce, a Beatles decoupage artist from Boston MA to name a few. A list of auction items will be available soon. Jorie Gracen, celebrity photographer of Paul McCartney and co-founder of popular band The Pondhawks, has also been personally affected by Japan‟s earthquake. She has four cousins living in Japan. Gracen will be donating a signed photograph to this fundraiser‟s auction. Silent auction donations will be gladly accepted until April 8. Monetary donations can be made now and sent to WONDERWALL Music Shoppe & Emporium through April 15, 2011. If individuals are unable to attend, please make a donation in honor of this event by sending a check payable to: American Red Cross. Please note in check memo: “Japan Earthquake & Pacific Tsunami Relief”. All donations over $250 will be acknowledged for tax purposes. WXRT radio personality and host of Breakfast with the Beatles, 2010 National Radio Hall of Famer and Chicago‟s #1 Beatles Fan, Terri Hemmert will also be on hand to emcee this event and lend support. The universal popularity and awareness of the Beatles help to make this an enjoyable and easily accessible fundraiser for those of all ages and backgrounds. The public is encouraged to attend or to make a donation in honor of the event directly to American Red Cross. Additional information can be found at http://sitaremporium.com/WWJapanFundraiser or by contacting WONDERWALL Emporium at 708.948.7986. Entertainment: Tribute band “BRIT BEAT”, Harrison Street Ukulele Players, Jay Goeppner,Phil Angotti, Eric Howell, Sandalwood Sitar Music Ensemble. Admission: $40 per person (100% of tickets sales proceeds to be donated to the American Red Cross), Door $45 per person. Gotta love this kid! Will he be the next Jake? Here's a sweet event for this Valentines Day - The 4th annual American English Concert in Kankakee, IL to benefit Habitat for Humanity. Check this out. Wish I could go but I did my Beatles trip to Vegas last summer and I'm also doing the Dave Ramsey plan now so no fabulous trips for me for awhile. Anyway, this looks great and it is brought to you by the guys from Liverpool Tours. Only $499.00 per person based on double occupancy. It's always more fun going with a group of fellow fans! 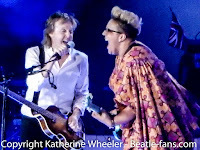 BeatlesMinute_042219 - News on Beatles relatives dominates this week's Beatles Minute podcast!